Flat weave rugs are rugs which are woven on a loom rather than knotted. 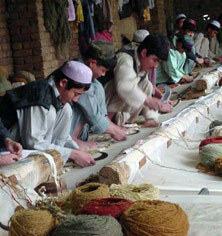 Because these rugs are woven, on flat looms lying horizontal, rather than knotted, they do not have a tufted pile. They tend to be much thinner than knotted rugs, making them generally less insulating. However, the thinness of a flat weave rug can be an advantage, especially in entry ways where the space between the floor and weather stripping of doors is minimal. Being that most of these rugs can be used on both sides these rugs are highly versatile; flat weave rugs have been used for thousands of years as flooring, wall hangings, saddle pads, and prayer rugs, and many cultures continue to utilize them for this purpose. Due to the way these are woven production time is much faster than hand-knotting but the end result is almost always a more rudimentary design and less dense than knotted rugs. These are great alternatives to hand-knotted without sacrificing quality or giving up too much longevity. After each row of knots are knotted on a hand-knotted rug a tool is used to pound down the next thread woven across, this tightens each row individually. This is also done on flat-weaves and ensures a tightly woven finished product that meets the high expectations of consumers. 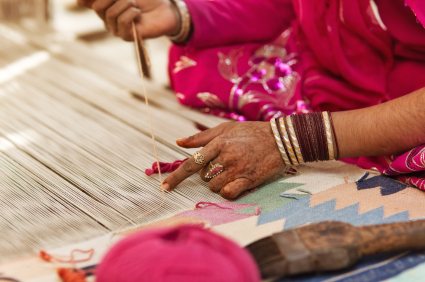 Just as mulitple weavers will sit at a loom and knot a single rug, multiple weavers will weave a flat woven rug together. Flat woven rugs are just that, woven flat. Being woven rather than knotted means that there is no pile to determine if one side is ‘up’ and another is ‘down’. These rugs are very durable and are often produced much faster than hand-knotted rugs.